Let your skin renew itself throughout the night with this 7-step nightly beauty routine that won’t break the bank. Your skin is begging you! Neutrogena Make-up Remover Cleansing Towelettes have been a staple for quite some time now. They are non-irritating to the skin and eye area and work great. I have yet to find a more natural make-up remover system that I am happy with. Avalon Organics makes Avalon Vitamin C Face Cleanser with an ingredient list that is full of antioxidant rich components, easy to read and free of sodium sulfates and parabens. It foams up easily to remove make-up and oils. How to use: Using a facial sponge, lather over face and eyes to remove all traces of make-up and mildly exfoliate. I love using soft sponges (my current one I found at Ralphs), they allow the cleanser to foam well and the surface area is the perfect size to get all around my face and neck. A new firm bristle toothbrush is the cheapest investment you can make to help maintain youthful skin. Dry brushing stimulates cell renewal by triggering the skin to “repair” itself and helps your skin glow by sloughing off what is dead. Doing this before applying your products will increase their efficacy. And who doesn’t want that!? How to use: Swipe the dry toothbrush in small strokes in an upward movement over entire face and neck. Be very gentle around eye area. Epicuren Protein Mist Enzyme Toner is a favorite; the smell alone will keep you coming back! It dries quick with no sticky residue. Again, with an ingredient list you can fully comprehend. How to use: After face is dry, spritz on and enjoy the pleasant aroma. Fine lines and wrinkles around the eyes is typically the first place you will begin to notice aging. Unfortunately, I have hit the age where this statement is very true. Therefore, eye creams have tantalized me. (Only tried about 50!) Currently I am using MyChelle Eye Cream . Among many natural ingredients, it contains Plant Stem Cells and Hyaluronic Acid to combat those pesky wrinks. Comfortable to wear without being sticky or greasy. At this point in time, I will continue to use; for the price, nothing I have found is comparable. How to use: Apply small amount to eyelid, under eye and temple areas. Like eye creams, many a serum has ended up on this face. Essentially, a serum is a very concentrated treatment intended to deliver it’s goodness deep into the skin. Andalou Naturals Fruit Stem Cell Revitalize Serum with Resveratrol Q10. is what is in the medicine cabinet at this moment. Love the feel after using, no complaints here. But what I love most is the ingredient list…I know what every single thing is, and that makes me a happy gal. And yes, I have seen a reduction in my fine lines…no need to use something that doesn’t work! How to use: Apply a small amount to face and neck. I wait until I’m getting into bed to apply a moisturizer. If you’ve read all the above steps, you can tell my biggest priorities in skin products are 1) natural ingredient lists with powerful anti-aging and cell renewal properties 2) products that leave my skin feeling soft and not sticky 3) RESULTS! Andalou Naturals Resveratrol Q10 Night Repair Cream meets all three of these listed requirements. How to use: Lather on face and neck. This list of 7 should be completed on a daily basis at night. 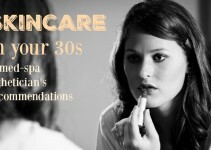 Read more: Skincare in Your 30s – the latest products I love, recommended by a med-spa esthetician. I loved this article and thought you would too. 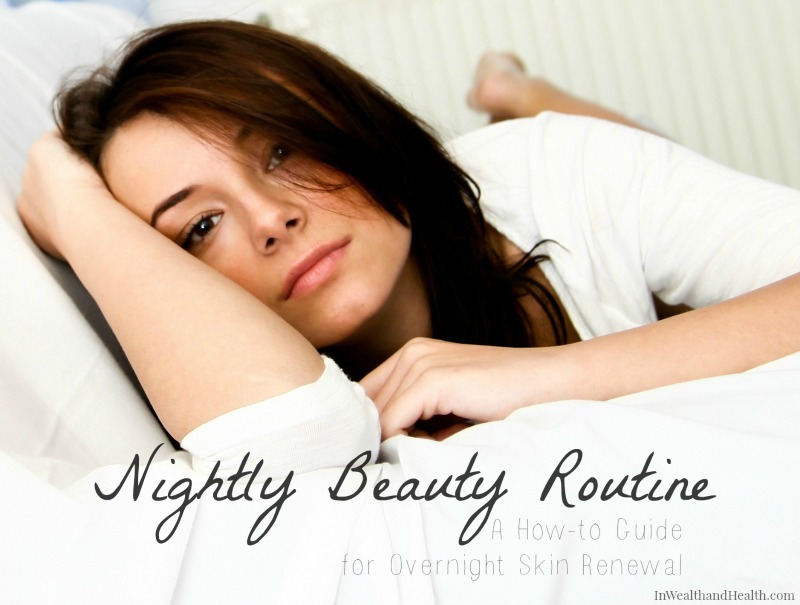 Here it is Nightly Beauty Routine: A How-to Guide for Overnight Skin Renewal located at http://www.inwealthandhealth.com/nightly-beauty-routine/.